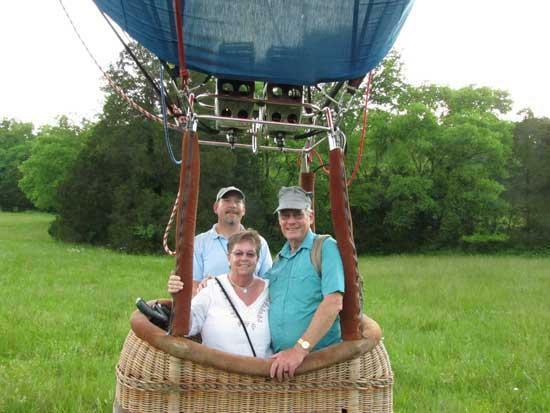 Ron Born and his sister Maureen Mackey won tickets for a free hot air balloon ride last year at the Good Ole Days in Woodbury. They used the tickets on Mother's Day this year. "I have to tell you it was the most wonderful experience we have ever had, I would do this again if I had the chance," Mackey said. "My daughters and grandchildren were there to see us off. I am pretty sure they will be selling tickets again this year and I advise everyone to take a chance you could be as lucky as we were." Mackey and Born are both members of the Cannon County Senior Center in Woodbury. The Good Ole Days event, which will be held May 20-21 on the Square in Woodbury, raises money to support the Senior Center along with the Cannon County REACH Afterschool Program. Neal Appelbaum with Reed Realty donated the balloon flight last year.